So will read the headline of an upcoming article in one of Dushanbe’s major newspapers, after Malik requested a meeting between me and some local reporters to ask me about what I thought of Tajikistan “from a tourist perspective.” They got more than they asked for, though – after I described my close, familial connection with the Malikzod family, they told Malik that they had already come up with the aforementioned headline for the article. The interview took about an hour, and took place in an old, foreboding, dimly-lit building with creaking doors and elevators that in America I would have described as “Soviet-esque,” but here in Central Asia, it would be because it was built by the Soviets for news and radio purposes decades ago. Malik handled all the translations of the reporters’ questions and my responses, which were recorded. They asked me questions pertaining to what I liked and didn’t like in the country, causing me to wax eloquently on the beauty of the mountains, rivers and people, but against the corrupt and stubborn police system. I half-wondered if my comments would be edited by the “establishment,” namely, the unpopular President Rahmon and his goons. I guess I’ll find out in a week, when and if it is published. The last couple days of my stay in Tajikistan were bittersweet. The previous day, after my return to Panjakent to the joyfully exuberant Raouf and his company of friendly archeology employees, Malik and I went hunting for pheasants and drank even more vodka with Russian businessmen who were visiting Raouf. We got a tour of the archeological sites themselves, 4 small squares of uncovered earth protected by huge metal shields erected over them. The shields guard ancient buildings made of mud and early brick, estimated to be between 6000 and 5000 years old. Raouf, as the curator and chief archeologist, showed us the pots and weapons over the dinner of cooked pheasant with osh, and laughed uproariously when I wore a 4000 year old cracked piece of jar on my head. Perhaps we had had one too many toasts of vodka, but the brotherly fellowship of drinking in this part of the world is just too welcoming to turn down. I drank what was offered to me, mindful of the fact that in just a few days I’ll be back in Jordan where the strongest drink easily at hand is in a teacup with an extra Lipton bag in it! It's hard to be taken seriously sometimes. When we returned from Panjakent late that night with Shirehlee, I knew that this would be my last day in the country and I wanted to spend it with my little sister. 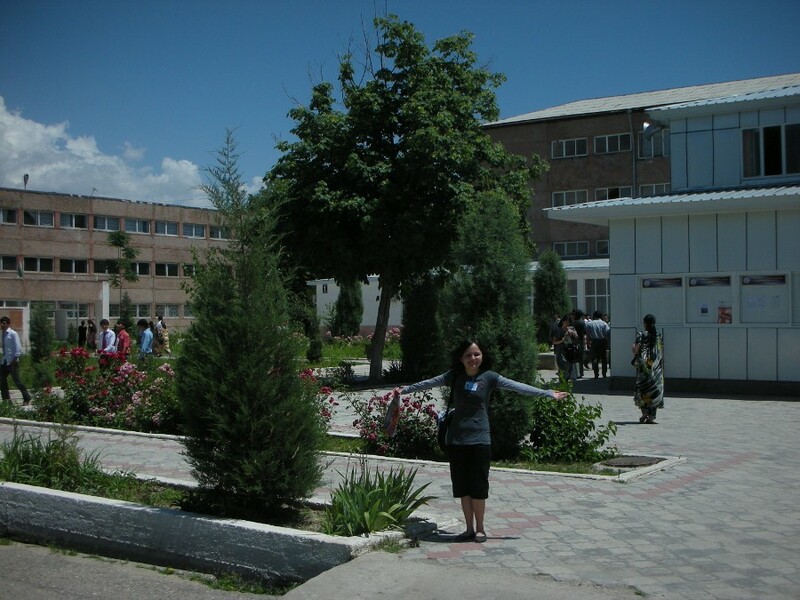 Without her, I’d never have had the slightest of chances to spend this much time here in Tajikistan, and with so much care and kindness. At my suggestion, Farahnush took me to her university a few blocks from home so that I could meet her friends and see what things were like. She was initially shy about about it, but I pointed out that I completely understand that this is a country that was only recently released from the grip of civil war and Soviet rule, only about 15 years ago – I wasn’t expecting to see Yale! Interestingly enough, I was given permission to attend her class on International Business, where I watched one of her classmates give a presentation, in English, about creating a motivational class for underclassmen. He introduced the lecture with, “Thank you for attending, to my teachers, my fellow students, and our guest from America.” I tried to imagine myself giving a speech in Arabic or Tajik, much less in front of people, and found my mind boggling at that sort of guts. I’m just too lazily comfortable with speaking in English, and having Wamidh as my translator, I guess. Farahnush’s classmates were very friendly and polite to me, although some did give me some curious stares, and the administration obviously thought that she was trying to sneak her boyfriend into the school and shot disapproving looks at us as we walked about the campus. I mean, I clearly wasn’t biologically related to Central Asia, although I mused about how I’d fit in if I just tanned a little bit more and dyed my hair black. But there were no problems getting into any of the classes that Farahnush took me to, and indeed several of the students thanked me for coming. Of course, it was my pleasure – I only wished that the school’s administration gave these young adults more credit for their intellectual ability. Several times, it seemed to me like the students were more likely to show up and do their job than the teachers were, which is a disservice to the hard work that the students are trying to put in. After the university visit, Malik and Farahnush took me for the interview, followed by a stop at the famous statue of King Ismoili Somoni, one of the earliest kings of the emirate of Central Asia who originally hailed from Tajikistan (which, as previously mentioned, used to contain Samarqand and Bukhara and the surrounding area before they were engulfed by Uzbekistan). Ironically, I was rather rudely treated by the local militia lounging around the statue, who shouted at me to get away from the statue and stand at least 30 meters away. I was quite irritated by their treatment, and if I could speak Tajik any better, I would have told them sarcastically that they shouldn’t have a big walkway that leads right up to the king’s foot, with differently-colored tiles in the plaza that clearly says “I’m a pathway; please walk on me.” Farahnush darkly told me not to bother, saying that they could barely speak Tajik, much less English. She explained that if it had been her or any of her friends, they could have done anything they wanted – but because I was a foreigner, the militia felt that they had free reign to do what they pleased. Unfortunately, this happened after the interview in the News Building, or else I definitely would have included it as the most ridiculous thing that had happened in the past two weeks. I love Tajikistan, but its ridiculous government needs a firm shakeup to make it more friendly towards outsiders (and our tourist currency). I’d say more here, but I’d rather that their government didn’t censor my blog so that Farahnush, Malik, and any other Tajiks can continue to read it. 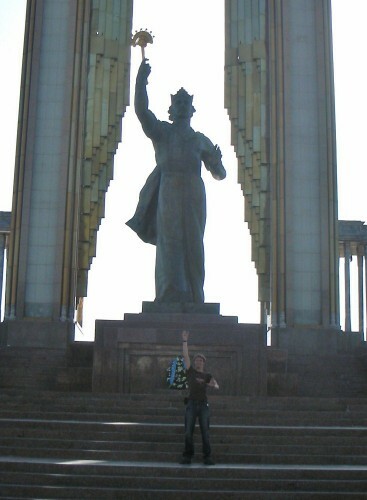 If the militia has a problem with me posing like King Somoni, then there should be signs posted saying "Do Not Attempt To Be Kingly"
My flight left Tajikistan at 5:30 in the morning. I didn’t sleep at all – too busy carefully packing away the many precious gifts from my family, from the Silk Road, and from the Pamirs away in my bulging suitcase, thankfully at least a little lighter from having given the keffiyehs and baklava I brought from Jordan to my adopted sisters and mother. 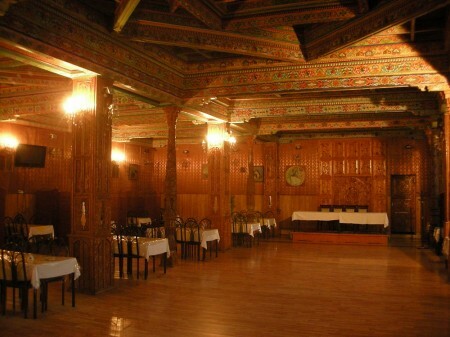 Although my bag was light, my stomach was full; Malik, Farahnush, and her elder sister Shazoda had taken me to Dushanbe’s greatest teahouse, the city’s pride and joy and the oldest in the country. The inner woodworking and painting definitely reminded me of a much more massive, much older version of the teahouse in Boulder, Colorado that I wrote about last year. Although I wouldn’t have minded eating inside under that beautiful canopy, the weather was too fine for us to ignore and we spent the last hours of daylight under a columned white portico, dining on our kebabs, soup, and salads. Reyhon, Farahnush, and Shazoda came out to the car to bid me farewell, eyes shining as the sun broke over the mountains in the distance. Dear, sweet Reyhon had become very attached to me and gave me a huge, tight hug, patted my face and called me “Zach-Jon,” which means “Dear Zach.” In return, I called her, “Oji-Jon,” or “Dear Mother.” This just seemed to make her cry harder, which made me want to cry too, but she managed a pleased smile at my usage of Tajik and hugged me again. That rare smile was one of the few that was to be found there as we stood around the car saying our goodbyes, like when I had said goodbye to Farahnush in summer 2008 when she left America, now I was doing the same as I left Tajikistan. What words can possibly describe the kindness of this family? Here I had just dropped out of nowhere for two weeks, and they took me in as their own and took complete care of me, setting aside their own tasks and responsibilities to make sure that I wanted for nothing. There’s no way I can ever repay kindness like that, and in true Tajik custom, for me to try would be an insult. Malik drove me through the dark streets of Dushanbe for the last time, a similar path to what we had driven two short weeks ago. I looked out into the dim early morning light at the streets that in such a short time had become almost familiar to me, and with a lump in my throat realized that this was it. I had to leave here, my third home, to return to my second home in Jordan, away from my first home and family back in Wisconsin that I hadn’t seen in 5 months, and won’t see for 5 more. 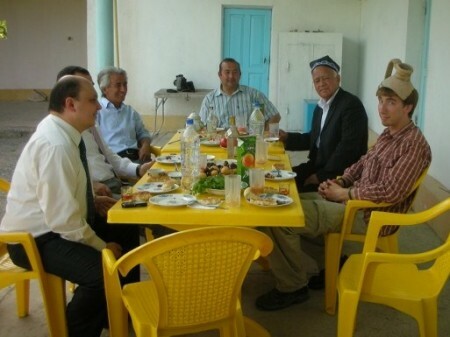 Malik quietly asked me what I had liked best about my trip, and I truthfully told him: More than any one experience or any blue-tiled building, more than any mountain range or roaring river, I had loved being part of a family again, as a Son – and Brother – of Tajikistan and its people. Beautifully expressed, dear — your last two paragraphs brought tears to my eyes, too! A fitting end to a wonderful visit, many thanks to Farah and her family! not sure if you’ll read this in time. I’m flying out to Tajikistan in 5 days and was wondering what gifts I could bring. what would people apreciate? What is difficult to get? who should I buy gifts for (as a women), i.e. do you (as a woman) only give gifts to women and children, or to the head of the family?